To create art is an act of faith. The artist opens a sort of "window into their soul" when they allow their work into the world. Like that sublime moment found alone in the studio, when inner voices speak through visual materials, or when thoroughly personal feelings are bared, without protection, in an effort to create something "beautiful," or something with strength and meaning. 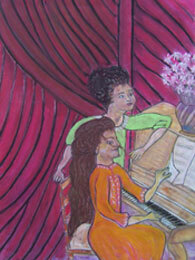 Almost every artist has experienced that moment when, looking at something new before their eyes, they say, "I love it!" and follow this quickly with, "But could I show it?" If they are brave enough, then dressed up in a carefully selected and professionally cut mat, and sporting an attractive (and pricey) frame, it's off to be hung, naked, on a wall, and subjected to the court of public opinion. Sound a bit risky? It is the theater of human expression, and sometimes a thumbs up or thumbs down can seem no less significant than it did back in the Coliseum arena of ancient Rome. We look for originality and for new ideas from art, but we are often slow to open up to such or to allow them into our collective consciousness. Technique we are familiar with, or a visual language we already know how to read, helps. Still, we are speculative, we can be fickle. So, in looking at art, we should try to match the sincerity of the artist who created it, before judging it. After all, by displaying their work, isn't the artist saying, "I share these innermost feelings with you, freely"? When it works, we find that the artwork also expresses our own feelings and intuitions. Now, we know Van Gogh had it rough. In a time when creating the illusion of reality on a two-dimensional surface was the universal measurement for authenticating art, he ignored hollow technique in favor of personal expression. 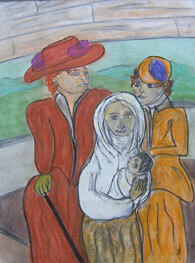 He went to the place of his innermost psyche and put that onto canvas to the best of his ability. After the end of his lonely and unrewarded life, we opened up to a human sincerity which still stuns us today. We also must own his rejected suffering. But in a world of post-modern thought, we are ready to consider the unusual obsession as authenticity itself, or the untrained hand of the "outsider artist" as a potentially viable expression of our collective experience. We are ready to judge new worlds by their own merits. Now, if you have agreed with these assertions thus far, you may be ready to consider the art of J. C. Smiley. J. C. Smiley, whose romantic pencil and pastel works on paper were displayed at Mocha Joe's during July, and continue on exhibit in August, began his obsession with two-dimensional representation right in the caféitself. Like all beginnings, however, that was not really the beginning. Joseph Smiley has had a busy life from the time of his early entrepreneurial schemes as a young boy, selling the idea for a fish tank installation company to hotels, to the present. From his work in ice cream sales and in steamy restaurant kitchens, mowing lawns, painting houses, managing motels (Rainbow Lodge), working as a car rental agent, or selling cars, as a record-setting salesman in ladies shoes at Jordan Marsh, crewing a "Loveboat" in the Caribbean, during a six-year stint in the military, as an accountant, in administration, as a collector of debts for various firms, as Xerox machine salesman, vineyard keeper, antique dealer, real estate speculator, and coin dealer and appraiser, not to mention collector, poet and sculptor, ah, philosopher . . . well, one might speculate that he brings a lot from life to his work. And it came to pass that J. C. Smiley picked up a pencil one day as he sat at the café, sipping his small, refillable French Roast in the to-go cup, and drew a little portrait of someone sitting in front of him. A face that intrigued him. And J. C. Smiley saw the portrait and said, "It is good." Now, over five hundred portraits and a year and a half later, he is much more sure that it is good. And many people agree. What is captured in Joe Smiley's work is an authentic expression of the deepest feelings of love, loneliness, hope and desire. It's those old reasons for expression which allow us the chance to reflect, in this case, on the human condition. His outpouring of work is the real thing, without the training, the cart before the horse, if you will. You'd have to say, however, that he pulls his horse, or his cart, or both, up the hill like a Sisyphus unbound. And he does find his moments of the sublime. As they say, to make a thousand is to make a good one. All of the pieces in the show were graced with poems taken from an outpouring of poetry which also occurred spontaneously, beginning in the year 2000 and lasting through 2003. In many cases, the title of the poem selected became the title of the drawing. The poems were adhered onto the pictures' frames. This interrupted the strength of the visual images a bit, but being his first show, it also seemed to express the palpability of his spontaneity. While Smiley has been open with the children's poems he has written, this was a deeper collection of verses. 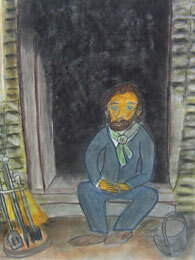 In a dark pastel entitled "Wooden Stoop," a solitary bearded man sits on the step outside a darkened doorway, gazing out at the viewer. Waiting quietly, with hands clasped, his expression seems to shift from simple sincerity to a deeply quiet intensity. His silence and solitude leave a thousand stories untold and remind us that that is our normal condition. A set of fireplace implements near his side oddly suggests that the doorway might be a fireplace, or perhaps that his life involves a fireplace. An empty vessel, a pot or basket, sits at his other side. The man and setting seem rural, the greyish clapboards of the house are backwoods banjo in character. But the strength of the piece is really in his gaze. We want to say, "Gaze away, old timer...."
These works were all finished as drawings before having color introduced, so sometimes he does and sometimes he doesn't. Smiley's drawing style, as developed through his portraits and into these works, can be seen well in a collage of drawings. The artist relies on a dark contour line to convey the image strongly, then creates subtle facial expressions to be read from close up. This technique was used by Picasso in many of his successful portraits and self-portraits. But the source of these drawings is something that Picasso, or even any Eighties kitsch artist, could never have imagined. There is a scene in the movie "Butch Cassidy and the Sundance Kid" where Paul Newman was courting his belle to the tune of that old song "Raindrops Keep Falling On My Head." He's riding around, doing hokey tricks on a bicycle in a sun-drenched barnyard, and through flowers and sunny foliage. It's real flower-power cinematography and the source of all of these studies. 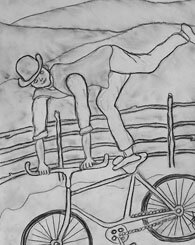 The visual element of the bicycle wheels, as they appear in various studies, helps to unite the drawings into the larger collage, and the change in scale in some of the views makes the grouping of thematic figure studies not unlike the original movie in its combined cinematic effect, the different shots shown together. 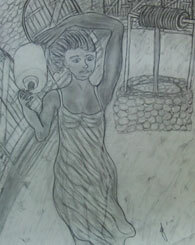 Be it intense nostalgia or cabin fever or what, the large work in graphite on paper is endlessly entertaining. Two other drawings, exhibited to the sides of a large mirror, were quite special. A work accompanied by the poem "Abyss To Fear" was actually quite light in nature. Exhibited in a nostalgic but dilapidated gold-leafed frame, there was a fragment of barbed wire hung ornamentally on one side. 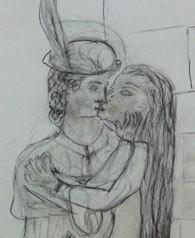 The drawing is of two figures stealing off from a late-night bar or café the male has his arm around her waist as they huddle into one shape. His hat pulled down a bit and the demeanor of the two harkens back to Parisian cafédays and the world of the Impressionists. The work is reminiscent of Toulouse Lautrec's caféposters. In fact, much of the work in the show has a strange "Parisian" quality, men and women sporting the latest French fashions, circa 1800. Eyes to the soft quivering bump of a kiss. J. C. Smiley is an artist whose sincerity is only surmounted by his obsession. And one we can enjoy.